The High Desert Mavericks tried to mount a comeback in April 1991, but Bakersfield's Fausto Tatis came on to shut the door, according to The San Bernardino County Sun. Down 6-2 in the ninth, High Desert scored twice, The Sun wrote. Then came Tatis. He induced a strikeout and ended the game. Tatis got that strikeout in his third season as a pro. That season also marked his last season. He made high-A, but didn't make it higher. Tatis' career began in 1989, signed as a free agent by the Dodgers out of his native Dominican Republic. Tatis started with the Dodgers in the rookie Gulf Coast League. He went 3-3, with a 2.54 ERA over 11 outings, nine starts. 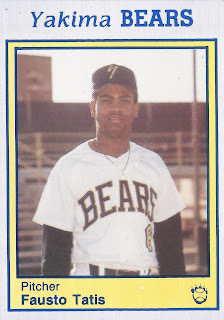 He then moved to high-A Bakersfield and short-season Yakima for 1990. He went 3-3 at Bakersfield, with a 5.97 ERA, and 1-4, with a 4.48 ERA over 13 starts at Yakima. He picked up one of his losses in an August game for Yakima, going four innings and giving up four runs. Tatis returned to Bakersfield for 1991. He got into six games, all in relief. He gave up 10 earned in 9.1 innings of work to end his career.